This PMR study offers a detailed eight-year analysis and opportunity assessment for the global Bauxite Mining market for the period between 2018 and 2026. For this study, we have considered 2017 as the base year while bauxite mining market numbers have been estimated for 2018 and projections have been made for the period 2018 to 2026. The CAGR (Compound Average Growth Rate), in terms of both volume & value, has been represented from 2018 to 2026. In this study on the Bauxite Mining market, various perspectives, such as bauxite mining market dynamics, competition analysis, pricing and value chain analysis, regional & segmental growth, macro-economic & industry growth analysis and segment-level projections, have been discussed in a comprehensive manner. After a detailed study of the global Bauxite Mining market and analysis of the perspectives of industry participants, it has been concluded that the global Bauxite Mining market is expected to grow at a value CAGR of 6.6% during the forecast period. Increasing demand for Bauxite to cater to the growing demand for aluminium products across the globe will be a positive growth factor for the market. 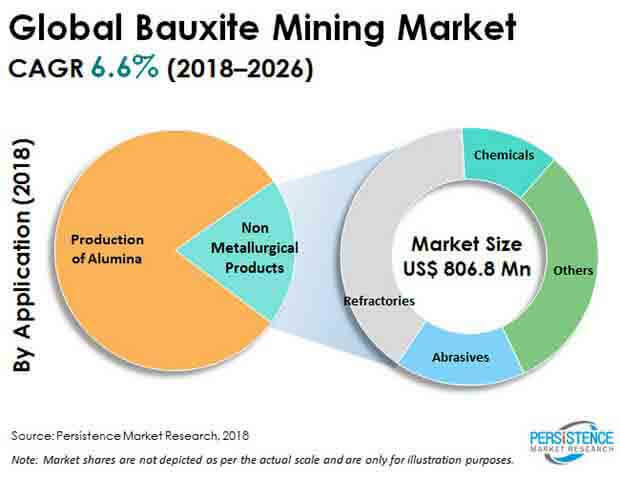 Growing demand for Bauxite Mining in the global market can also be attributed to growing penetration of lightweight aluminium products in automotive, electronics and other industries. This report on the Bauxite Mining market analyses the market at a regional and global level through various segments on the basis of key parameters, such as application and region. The main objective of this report is to provide key insights regarding ongoing trends, competition positioning, growth rate, market potential and other such relevant information & statistics in an appropriate manner to the buyers or various stakeholders in the global Bauxite Mining market. In this report on the global Bauxite Mining market, all sections have been structured in a systematic way to allow the readers to develop a detailed understanding of the global Bauxite Mining market. This report on the Bauxite Mining market begins with the executive summary of the report, which is followed by market introduction, market dynamics, market background and market analysis by key segments at a global level. Further, regional analysis and competition landscape have also been included under the scope of the report. Each section covers qualitative and quantitative assessment of the Bauxite Mining market on the basis of current developments, historical developments, trends and key opinions gathered through primary interviews with industry participants. The Bauxite Mining market report begins with the executive summary, in which a detailed overview of the whole market has been presented. In the next section, the report provides a market introduction and market definitions along with taxonomy. In the next section of the report, important market background information, such as macro-economic & forecast factors, industry factors, pricing analysis, value chain and a detailed assessment of the sales of Bauxite for the base year, has been included. In the following sections of the report, market volume (‘000 Tons) and value (US$ Mn) projections for the aforementioned segments, followed by the summarised view of the seven prominent regions at a global level, have been included for the Bauxite Mining market. In order to provide an accurate forecast, we started by calculating the current market size, which provides a basis of how the market for Bauxite Mining is expected to grow in future. To get a better understanding of the characteristics of the Bauxite Mining market, we triangulated the outcomes of three different types of analysis: primary, secondary and PMR analysis. As previously stated, the global Bauxite Mining market has been split into two segments. These segments, on the basis of application and region, have been analysed on the basis of BPS (Basis Point Share) to understand the relative contribution of the individual segments to the growth of the overall Bauxite Mining market. This information is important for the identification of various trends in the global Bauxite Mining market. In the last section of the Bauxite Mining market report, a competition landscape of the Bauxite Mining market has been included to provide a dashboard view to the report audiences, categorised on the basis of players present in the value chain, their global presence in the Bauxite Mining market and other differentiating factors and strategies. The primary providers covered under the scope are the producers or manufacturers of Bauxite. In addition, the section is mainly designed to provide a detailed comparative assessment of the key players in the Bauxite Mining market and their place in the value chain. In our study, we have also included detailed company profiles of key players in the Bauxite Mining market to evaluate their long- & short-term strategies, recent developments and key offerings. Some of the key players covered in this Bauxite Mining market report are Alcoa Corporation, Rio Tinto Plc, National Aluminium Company Limited, Australian Bauxite Ltd, Gujarat Mineral Development Corporation Ltd, Norsk Hydro ASA, Metro Mining Ltd, ASHAPURA GROUP OF INDUSTRIES, The Aluminium Corporation of China and United Company Rusal PLC, among others. Under the scope of study on Bauxite Mining, we have covered detailed information about Bauxite Mining market structure, ongoing trends, value & volume projections, competition landscape and dynamics in the Bauxite Mining market, along with recent developments across the global market for the study period 2018 to 2026. The global market of Bauxite Mining is projected to grow at a significant CAGR of 6.6% and will reach US$ 20,661.9 Mn by the end of the 2026. Moreover, with growing demand for aluminum products across the globe, Bauxite Mining activities will increase and are expected to gain significant traction in the coming years. Moreover, growing adoption of aluminum products across the globe owing to their light weight and other such properties will be a key driver for the Bauxite Mining market. Bauxite is available in huge quantities across the globe. However, its mining and export patterns have changed significantly according to the availability of Bauxite. Bauxite is majorly consumed in the manufacturing of alumina within the aluminum industry. Approximately 6.5% of total Bauxite produced is consumed in non-metallurgical applications, such as in abrasives, refractories, chemicals and others. Indonesia has re-entered the Bauxite Mining market after the ban imposed on the export of Bauxite in 2014. The government of Indonesia had banned the export of Bauxite to enhance its own smelting industry. Furthermore, Malaysia is also expected to re-enter the Bauxite Mining market during the first half of 2019. The government of Malaysia had banned Bauxite Mining in the country in 2015 with an aim to curb growing pollution due to sudden expansion in Bauxite production in the country. The key reason behind this expansion of production in the country was to fill the supply gap in 2014 after the Indonesian government banned Bauxite export. Asia Pacific is one of the most prominent regions in the global Bauxite Mining market. In terms of consumption, the region is estimated to hold more than 79.3% share in the global Bauxite Mining market by the end of 2028. Moreover, growing demand for aluminum products in the region can be attributed to infrastructural development and rapid establishment of various industries. Hence, growing demand for aluminum products from the region is anticipated to create healthy demand for Bauxite Mining in future. Furthermore, North America is estimated to hold minimal share in the global market. This can be attributed to the limited Bauxite reserves in the region. The region is importing alumina directly rather extracting it from Bauxite itself. The global market for Bauxite Mining is moderately consolidated. Tire 1 players hold the dominant share in the Bauxite Mining market. Moreover, the manufacturers are operating mining activities in multiple locations across the globe. Many manufacturers are operating mines in collaboration with other market players. Moreover, rather than providing the raw material i.e. Bauxite, manufacturers and governments of various regions are engaged in the manufacturing and supply of semi-finished or finished products (alumina or aluminum) directly to end users. Manufacturers having their own mines are engaged in further processing of alumina and are exporting the rest after captive consumption. Manufacturers who do not have their own Bauxite mines are importing Bauxite ore or alumina to feed their refinery/smelters. In the recent past, the Bauxite Mining market has witnessed significant developments from a competitive perspective. Collaborations, mergers and acquisitions are some of the key strategies being opted by prominent players to sustain in the global market of Bauxite Mining. Some of the market participants covered in this global report on Bauxite Mining are Alcoa Corporation, Rio Tinto Plc, National Aluminium Company Limited, Australian Bauxite Ltd, Gujarat Mineral Development Corporation Ltd, Norsk Hydro ASA, Metro Mining Ltd, ASHAPURA GROUP OF INDUSTRIES, The Aluminium Corporation of China and United Company Rusal PLC, among others. How has the Bauxite Mining market evolved over the past five years? What shape is the Bauxite Mining market expected to take in terms of volume and value during the study period? What are some of the competition developments and trends in the Bauxite Mining market? What are the prevailing market dynamics in the Bauxite Mining market? What are the underlying macro-economic and industry factors impacting the growth of the Bauxite Mining market? What are the market positioning and key strategies of key manufacturers as per the Bauxite Mining market taxonomy? Which are the key challenges, opportunities and improvement factors for Bauxite Mining market players? How is the competition structured in the Bauxite Mining market and how has it evolved over the past few years?